Play as a builder and construct the craziest theme park you can imagine! 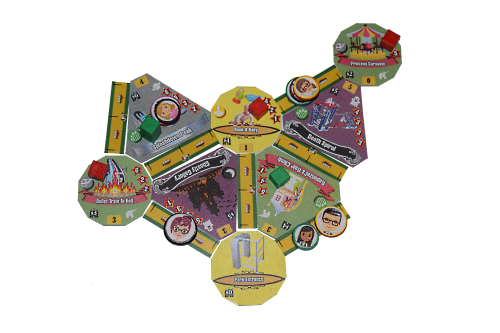 Builder players select from unique tile shapes featuring wacky rides, shops, shows and more. They also manage their parks and incentivize visitors to hit their park over their opponent’s. Or play as visitors, riding the attractions and maximizing fun on your dream vacation! Visitor players draft their party, build family relationships, and hit the parks as they’re being built! Ride attractions, collect souvenirs, and make memories! 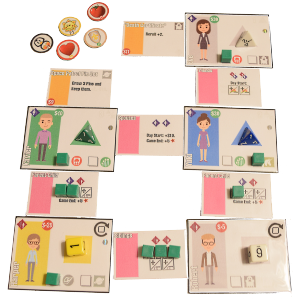 Park Runners features dual play roles that play simultaneously, so one builder and one visitor player are always taking turns. Victory comes not only through topping opponents of your role but also through maximizing interactions with the others. Builders who cater well to the preferences of visitors will see their ticket sales soar! Visitors who carefully manage their park experiences and make their desires known to builders will find more opportunities to maximize their fun!